Women preparing for milking at a dry season cattle camp (wec) next to a large river, probably the Sobat. 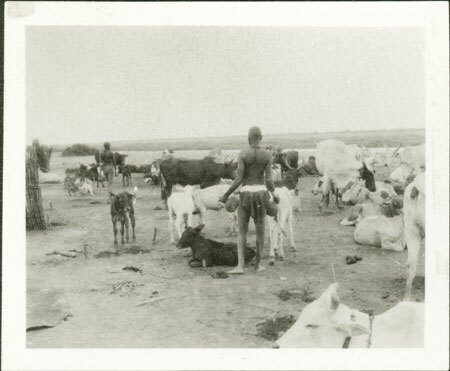 This would suggest the camp to be Yakwach where Evans-Pritchard spent 3 months in 1931 among the Lou Nuer. The woman in the foreground stands with two milking gourds next to a number of tethered calves. Another woman with a gourd is walking away, possibly following an untethered calf to its dam, who will then be milked, the calf being allowed to return to feed afterwards. Milking is performed in the morning and evening by women, girls and unitiated boys. Note on print reverse ms pencil - "2 8 "
Morton, Chris. "Nuer cattle camp milking" Southern Sudan Project (in development). 03 Jan. 2006. Pitt Rivers Museum. <http://southernsudan.prm.ox.ac.uk/details/1998.346.8.2/>.